Seminar on " Employability Skills Awareness"
This is for information of all concerned that a Seminar on " Employability Skills Awarenessjointly organized by ASA University Bangladesh (ASAUB) & INFINITY HR Company Limited will be held on 22 December, 2014 (Monday) at 3:00 PM in the ASA Conference Room (9th Floor) of ASA Tower. Honorable Vice Chancellor Prof. Dr. Dalem Ch. Barman has given his kind consent to grace the program as the Chief Guest. Honorable Treasurer, Honorable Adviser, respected Deans of all faculties and Chairmen of all departments will also be present in the program with their valuable speeches. All students, teachers and administrative staffs are requested to attend the seminar. 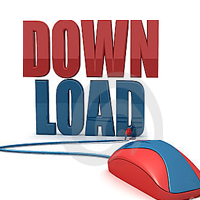 Date : 22 December 2014 at 3:00 PM in the 9th floor (Conference Room) of ASA Tower. 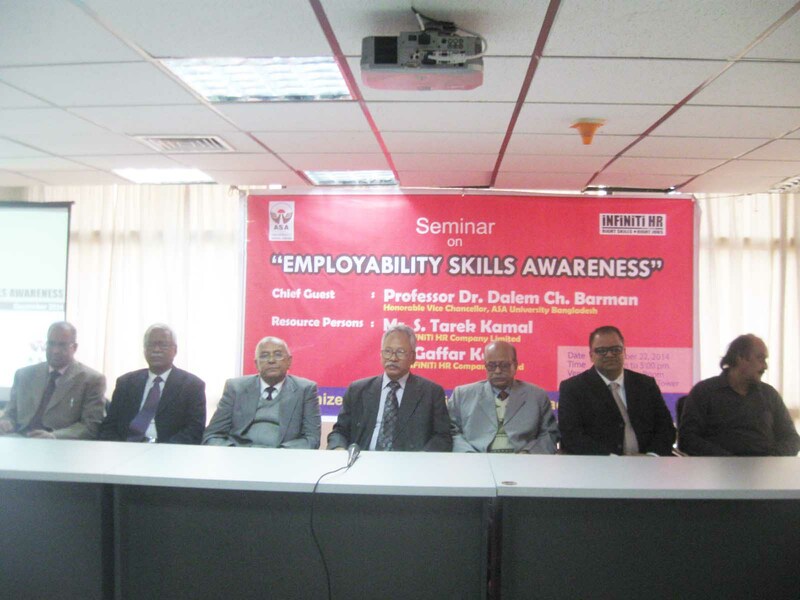 Career Counseling Center of ASA University Bangladesh (ASAUBCCC) organized a seminar titled " Employability Skills Awareness" for enriching students necessary knowledge and skills at ASAUB campus on 22 December 2014. Honorable Vice Chancellor of ASAUB, Professor Dr. Dalem Chandra Barman, was present as the Chief Guest in the program. Mr. S. Tarek Kamal, MD of Infiniti HR Company Ltd., Group Captain (Retd.) Mr. Gaffar Kabir, CEO, Infinity HR Company Ltd. and Mr. Md. Nazmul Hoque, PPM, former Additional IGP of Bangladesh Police were present as the resource persons and delivered their valuable speeches. Prof. Md. Muinuddin Khan, Adviser of ASAUB, Prof. Dr. Abu Daud Hasan, Dean, Faculty of Arts & Social Sciences, Prof. Dr. A.B. Siddique, Dean, Faculty of Law, Prof. Md. Nazrul Islam, Dean, Faculty of Business also spoke in the seminar. The Registrar of the University Mr. Md. Khalequzzaman delivered the welcome speech in the seminar. Mr. Bhokto Kumar Biswas, Assistant Professor, Dept. of Business Administration, ASAUB conducted the program. In their speeches, the speakers, emphasized on the necessary preparation to get the desired job. They also focused on how to prepare curriculum vitae, face interview and overall measures, which are helpful to the job seekers. They also emphasized on knowledge and the confidence building for the job seekers. Chairmen from various departments, Additional Registrar of ASA University Bangladesh Mr. Md. Ashraful Haq Chowdhury, faculty members from various departments, students and officials of ASAUB were also present in the seminar. 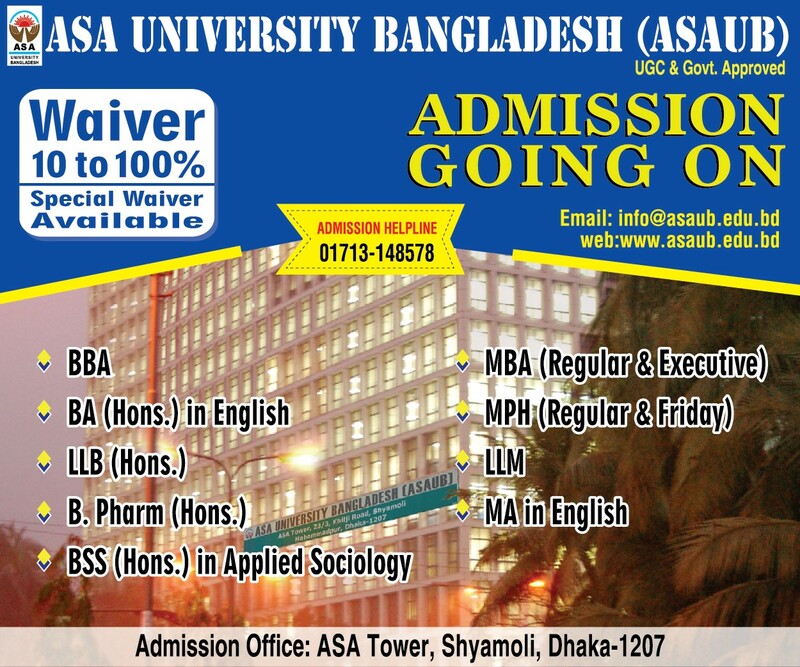 Career Counseling Center of ASA University Bangladesh (ASAUBCCC) conveys thanks to Deans of all faculties, Chairmen of all departments, Faculty members, students and officials of ASA University Bangladesh for their valued participation in this seminar.